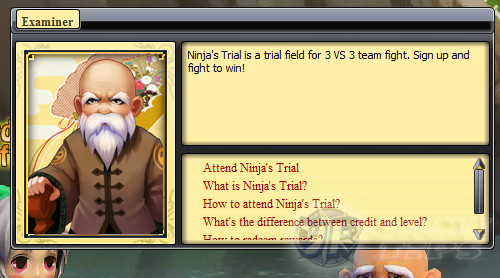 The Ninja Trial is a 3 vs 3 Team Fight field. You may choose to fight with your top 2 friends or fight alone! Earn credits from the Ninja Trial and use them to redeem items in the Trial Shop. Rewards includes Likings and Bloodsouls! 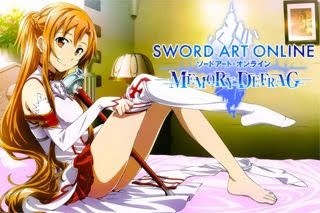 - Go to Angel City and enter the Ninja Trial located in the city's Waterfall. - Must be level 40 and above. the Test Officer NPC and select the "How to attend Ninja's Trial" option. 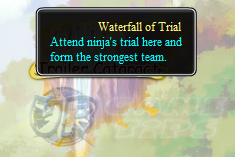 - Click on "Attend Ninja's Trial" to proceed. - The system will automatically find teammates for you. - Characters with similar levels with you will be chosen first. - Team up with your friends and create a 3 man team! - Teams with similar levels with your team will be chosen first as your rival team. - Trial level will increase as your team attend more trials. - A number of Trial credits will be rewarded in every fight, win or lose! - Earned Trial Credits can be redeemed for awesome rewards! - Click the "Reward Redeem Officer" NPC and enter the Trial Shop. - Most of the rewards will help you get or enhance Bloodline Limits! - Character Likings or Favorite Items! - Low to High leveled Bloodsouls! If you don't have any Bloodline Limit yet refer to the below link to get one now!